Greetings friends, 2019 it is here, and not only that, all the Community events start now to kicking off another season which will be much better than previous years in terms of content and of course new products and integrations. 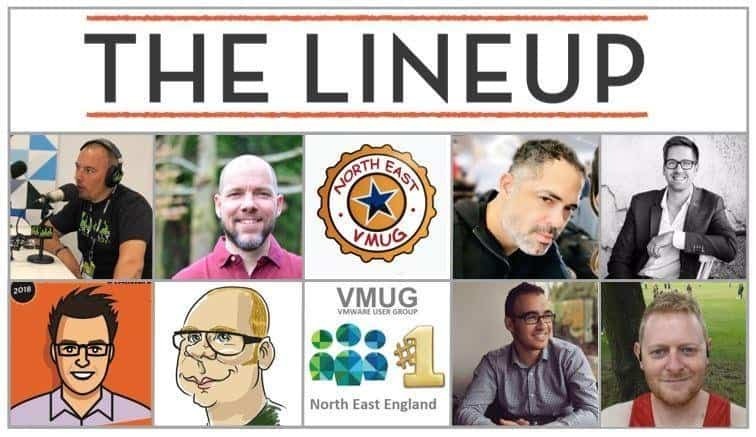 I was lucky enough to be selected as an speaker for the upcoming North East VMUG, which will take place on Thursday 7th February, among an impressive list of speakers, if you are around the area I will encourage you to attend, learn something new this day, and have the chance to speak with great professionals, not just the speakers but of course the rest of the attendees, which it is really the best of this VMUG the chance that we have to meet new peers, share some designs around our Datacenter, gather feedback and opinions and learn something new. Where is it, and how to get there? In this session Duncan will discuss where we are today when it comes to VMware based Infrastructures. More importantly, we will be discussing where we are going tomorrow and how hyper-converged technologies help optimizing data center and operational efficiency. Current common challenges will be discussed, followed by solutions to those challenges. Be warned, this session will include forward looking demoes and statements. In this session Kev will discuss the reasons to upgrade to the latest releases of vSphere, things to consider as you plan and then walk you through the steps involved. Covering upgrade paths, migration from the Windows based vCenter Server (*shudder*), vCenter High Availability and the convergence tool to move your legacy external PSCs to the recommended embedded topology. Bring your questions – there may be prizes for good ones. In this session Christopher Lewis will be sharing recent experiences from the field when delivering VMware vRealize Suite Lifecycle Manager (vRSLCM). Starting with a lightning introduction to vRSLCM, he will swiftly move onto covering some high level design considerations before spending time walking through the tips and tricks learnt during his experiences delivering vRSLCM in the field as a PSO Consultant. The session will close with a recap of the things to remember when working with vRSLCM. In this session we will see the different ways to monitor our vSphere environment and we will see how to create from scratch an open source, scalable and completely free monitoring system using InfluxDB, Telegraf, Grafana and making use of vSphere’s own SDK. It’s time to revolutionize your data protection with a converged and continuous Disaster Recovery and Backup solution for both short-term and long-term data retention. Worried about Ransomware, or other unplanned disruptions and recovering fast enough? Continuous Journal-based recovery gives you DVR-like abilities to rewind and resume from any point in time to protect against logical & hardware failures, human mistakes, and natural disasters. Learn how Zerto uses its journaling technology coupled with continuous replication to protect and recover files, VMs, applications or even entire data centres and resume from just seconds before an incident – unlike out-of-date backups or snapshots.